Last month, while in mediation with Source, I saw a huge sphere-like cloud in space. It had a translucent creamy white background that was dotted with a full spectrum of hues. This massive rainbow cloud was in close proximity to our solar system, and we appeared to be moving towards it. I was told it came from the galactic core, and it would act as the catalyst for our ascension. I wasn’t sure about the validity of this vision, so I asked my guides for more information. Several weeks later, I received the confirmation I needed while listening to David Wilcock on Jimmy’s Church’s Fade to Black internet radio show. In the latter part of the interview, David discussed how global warming is affecting all the planets in our solar system. David has done extensive research over the past decade that clearly shows our entire solar system is heating up. While this was not news to me, I was surprised to learn of the cause. David revealed that our solar system is drifting into a cosmic cloud of very hot, highly magnetic plasma. I knew as soon as he uttered those words that the cloud he described was the same one from my vision! As our solar system drifts into this rainbow cloud, it stands to reason that the same thing is likely to happen to our Sun. That possibility is strengthened by numerous ancient texts from cultures around the world that predict a coming solar event. The Vedas, for instance, refer to it as Samvartaka Fire, and they describe rainbow coloured clouds appearing as people attain their rainbow body (a.k.a. the spirit light body). 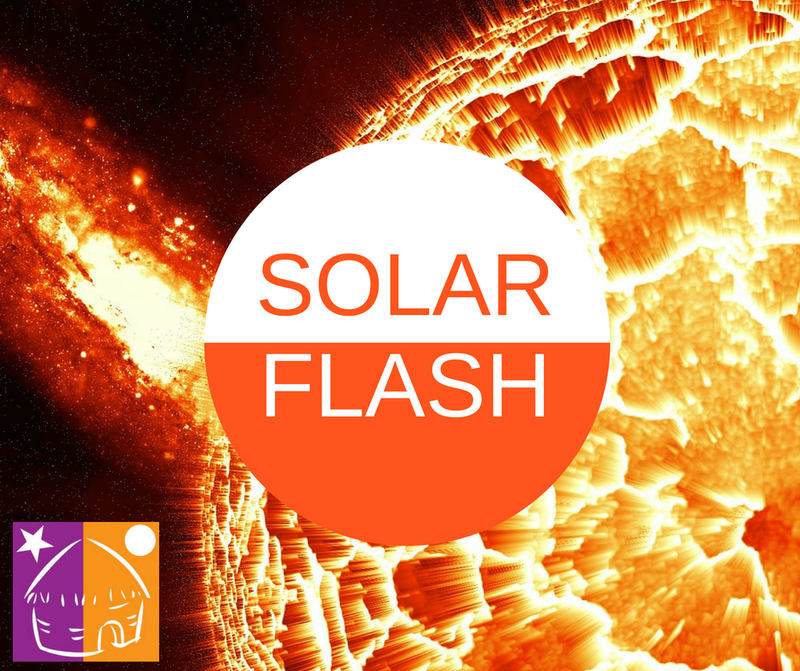 The solar flash not only heralds the dawn of the new golden age, but it also acts as a glorious catalyst for our metamorphosis and subsequent ascent into 5-D. All the ascension upgrades and symptoms we have gone through are in preparation for this coming event. It’s likely that our neighbours from Proxima B have already ascended and, if science and prophecy prove correct, we will soon be joining them. As thrilling as it may be to contemplate the solar flash, we should not lose sight of what matters most. It is the journey that both enriches and prepares us; not the singular event. We must endeavour to be present and happy right now. So rather than longing for or worrying about the ascension, and ultimately deferring your happiness, find your joy today. Do what makes your heart sing, and that will help keep your vibration high, which in turn, will facilitate your ascension. No one has all the answers, and so there are no guarantees what will happen, or when. You need to have faith that everything will work out perfectly. Trust in your highest self, for you are a spark of the Divine and are thus a co-creator with Source God. You come from Love, and you will return to Love when this multiverse journey is complete. Until then, let your heart be your guide. I’ve sensed that my starseed origins may be from Alpha Centauri. Have you noticed any distinct characteristics of starseeds from there? Since you’re able to tune into the cloud, and Alpha Centauri has already passed through it, do you have any estimation of your own regarding timeframe? With the galaxy and solar system’s clockwork motion, there’s only so much leeway to postponing the event if it’s based on such a physical activation, it would seem. Thanks for your comments. You ask some great questions. I’m not sure I have the answers you’re seeking. In regards to Alpha Centauri, I haven’t met enough starseeds from there to form any kind of overview of their traits. The ones I did meet were very similar to us, except they were more peaceful and more ‘evolved’ (how I imagine we would be in the future). The time frame of the event isn’t one I’m going to speculate on. There are timeline wars happening, and we ourselves are timeline jumping. That’s why I say it’s best to focus on the present, rather than on the event. Thanks for your responses. That was about the answer I expected regarding timing, but it was worth a shot. 😉 I agree with finding our joy now. I supposed “peaceful and evolved” is about how I feel. I intuited the Alpha Centauri connection when I went to a “resting room” one night because I wasn’t feeling well due to energy pressure in my head and insomnia. It seemed off-world, but very Scandinavian. It was “true healthcare”, not flying-blind chemistry. Your vision sounds fascinating, and it strongly indicates a past life connection with Alfa Centauri. In my experience, many starseeds return to their homeworld at night, or during meditation, for healing and comfort.